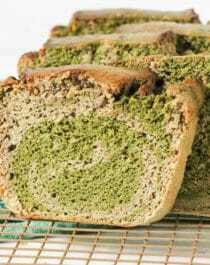 Ever heard of Matcha Green Tea Banana Bread? Probably not, but lemme tell ya, it’s one of the greatest things I have shoved in my face in a long time. It’s super moist yet incredibly fluffy. It’s perfectly sweet, yet has no sugar added, and it’s high protein, high fiber, gluten free, and dairy free too. One bite and you’d never know it though… this tastes like seriously sinful stuff! Am I alone in wanting Banana Bread like, 24/7? I promise you, there will never come a day where I don’t or can’t crave Banana Bread. That is a fact. Like, I’d put money on that. BUT. I will say that Banana Bread can have a little variation here and there. Some people like adding walnuts, some people like chocolate chips, or maybe even a chocolate swirl. 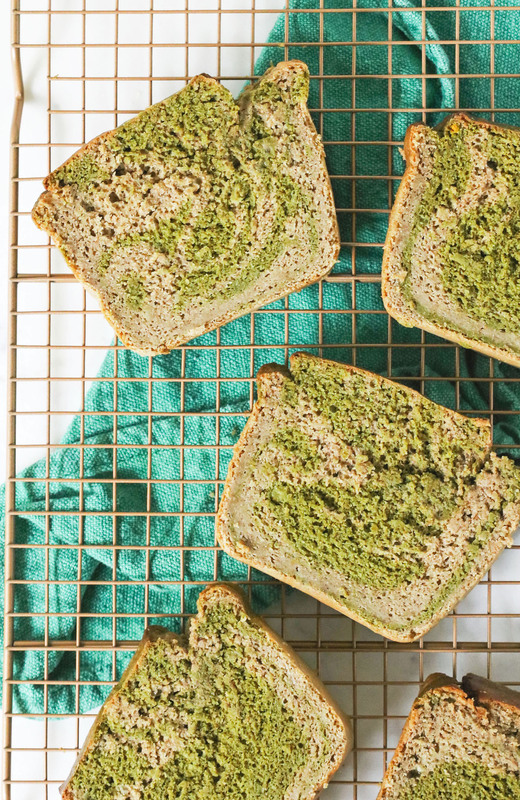 What you’ve probably never had before is a Matcha Banana Bread! Most definitely a recipe I’m super, super proud of. It’s incredibly moist and rich and satisfying. And thanks to the healthy fats, complex carbs, fiber, and protein, you’ll be full after one slice. So say goodbye to eating 3 slices of Banana Bread in a row! Or if you’re anything like me when I was back in high school, say goodbye to eating ¾ of the entire loaf pan in a single sitting (eek… tsk tsk old Jessica, tsk tsk)! Preheat the oven to 350 degrees Fahrenheit. Spray a 9×5” loaf pan with cooking spray and line one way with parchment paper for easy removal later. In a medium-sized bowl, whisk together the sorghum flour, oat flour, erythritol, baking powder, cinnamon, and salt. In an electric stand mixer bowl fitted with a whisk attachment, add the mashed bananas and almond butter. Mix on low speed. With the mixer running, add the eggs, vanilla extract, and stevia extract. Add the almond milk last. Turn off the mixer and scrape down the sides of the bowl. Dump the dry ingredients into the stand mixer and return mixer to low speed. Increase the mixer speed to medium. Mix until the ingredients are fully incorporated. Scoop 2½ cups of the batter into another bowl. To that, whisk in the matcha powder, turmeric, and almond extract. 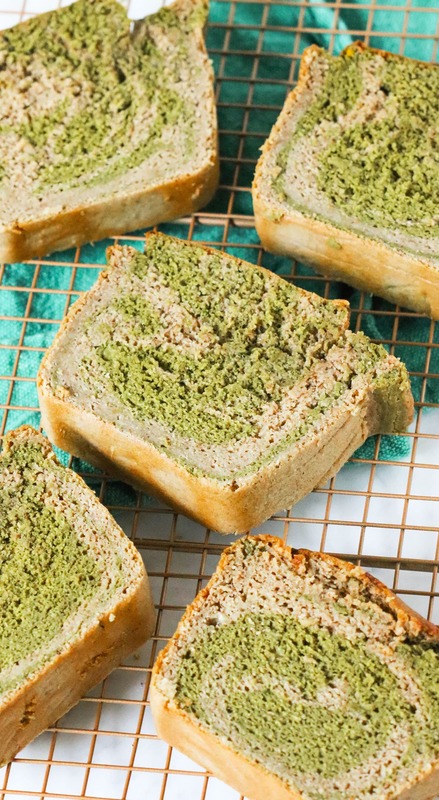 Pour ⅓ of the original batter into the prepared loaf pan, then ⅓ of the matcha batter, then ⅓ of the original, etc. repeating until all the batter is used up. Use a knife to swirl the two batters to create the marbled effect. Bake for ~1 hour + 20 minutes, or until the surface springs back when tapped. Let cool in the pan for 1 hour, then transfer the loaf to a wire cooling rack to cool completely. Slice, serve, and enjoy! Store in a tightly sealed container in the fridge for up to 4 days. Do not open the oven while this bakes or else you’ll let out the heat and it won’t bake fully! Also be sure to use an oven thermometer to make sure your oven doesn’t drop below 350 degrees Fahrenheit. This Marbled Marbled Matcha Green Tea Banana Bread is so moist and fluffy, it doesn’t taste gluten free, dairy free, sugar free, and high protein ONE BIT!